In the jargon of finance, America is suffering from a capital allocation problem. The country seems incapable of making the necessary investments to fuel future productivity and growth, or to ensure widespread prosperity. At the government level, public spending on basic research and development as well as infrastructure investment has declined significantly over the past several decades. This trend, of course, should not be surprising, as reducing government spending has been a conscious policy objective for many years, especially (though not exclusively) for conservatives. Over the same period, however, business investment has also declined. As a percentage of GDP, corporate investment has been in a long-term downward trend since 1980. And this trend is much more pronounced when viewed as a percentage of corporate profits or market capitalization. This latter fact is particularly problematic for advocates of “free market” policies: if “getting government out of the way” does not lead to more entrepreneurial investment in the private sector, then what’s the point? Indeed, the entire neoliberal/libertarian economic policy toolkit has essentially been discredited by its failure to generate increased business investment in recent decades. To take the most recent examples, the 2017 corporate tax cut was sold in large part with claims that it would increase private-sector investment, thus driving growth. Yet although there was some uptick in investment in early 2018, capital spending has stalled out in recent months, and growth estimates have been revised downward. In fact, in the second and third quarters of this year, S&P 500 companies spent more money buying back their own shares than on capital investment. For the foreseeable future, the prospects for any major boom in investment—certainlyone matching the magnitude of the tax cut—are dim. Apparently the Trump administration’s vaunted deregulatory agenda has not worked either. Looking back further, the Fed’s uniquely accommodative monetary policy in the aftermath of the financial crisis did lead to extraordinary asset-price inflation, but it did not produce anything approaching extraordinary investment growth. Meanwhile, the much-lauded “gains fromtrade”—really increases in corporate profits from tax and labor arbitrage—were never reinvested in the domestic economy. Nor were increased monopoly rents resulting from relaxed anti-trust, nor the labor cost savings resulting from de-unionization. In short, neoliberal policies—from tax cuts, to deregulation, to trade liberalization, and so on—have produced massive increases in corporate profits, but these profits have not been reinvested in productive, entrepreneurial activity as promised (nor, of course, have they gone to labor). Instead, they have simply flowed into financial markets and remained there. But without sufficient investment into productivity-enhancing technologies, facilities, equipment, and the like, productivity has inevitably stagnated, and the economic prospects for future generations have deteriorated. In addition, given the highly unequal distribution of stock ownership (50 percent of Americans own no stocks; the top 10 percent own over 80 percent of equities, and the top 1 percent owns almost 40 percent), more capital flowing into financial markets has led to and will only continue to exacerbate gaping inequality, apparently with no compensating benefit that was supposed to come from increased investment. The net result, as William Lazonick has argued, has been the construction of a “value extraction” economy rather than a system that rewards “value creation.” In other words, the financial markets are rewarding corporate behavior that extracts value from capital assets in order to convert it into liquid financial assets, rather than incentivizing the investment of financial assets into the real economy. Many serious voices on the left have been calling attention to these problems for some time, unfortunately to little apparent effect even within the Democratic Party. But the situation has gotten so bad that critiques of the current system and new policy proposals to address its problems are starting to come from some unexpected quarters. Larry Fink, the CEO of BlackRock, recently called on companies to focus more on long-term capital investment rather than the short-term boosts of financial engineering (though there is no indication that BlackRock has used its considerable power as a massive institutional investor to force changes in corporate behavior). Moreover, today, Senator Marco Rubio proposedamending the tax code such that corporate share buybacks would be deemed dividends and taxed accordingly. This would remove the tax advantage/deferral that buybacks currently enjoy versus other forms of capital return, and aims to reduce the warped incentives that reward financial engineering at the expense of productive investment as well as labor compensation. Needless to say, this tax change, even if implemented, would not itself solve all the problems related to counterproductive corporate behavior and financialized “shareholder capitalism.” Yet it is certainly the first serious attempt to address these issues—and one that goes beyond the conventional policy toolkit—to emerge from a Republican. If discouraging financial engineering is now a bipartisan cause, it seems likely that a new and perhaps more concrete public debate around these issues will have to occur. And while the basic positions on these matters are fairly well defined, many delusions persist, so it is worth investigating in particular the issues around share buybacks. At this point, the only remaining intellectual defenders of share buybacks or financial engineering more broadly fall into two groups. First, there are the salaried salesmen of “free market” think tanks, who typically have no practical knowledge of financial markets or the business world (indeed it is shocking—though probably not accidental—how few libertarian think tank commentators have any real-world business or Wall Street experience). On the other hand, the second group is mostly comprised of a few mediocre stock-pickers with academic pretensions like Cliff Asness who are basically talking their own book. Their main argument is that returning capital to shareholders does not reduce investment but simply allows for the reallocation of cash from one company to another which could deploy that cash more efficiently. As an aside, some still argue that buybacks serve a bona fide business purpose, like “restructuring,” but anyone with any experience in institutional investing recognizes these arguments as utterly frivolous. 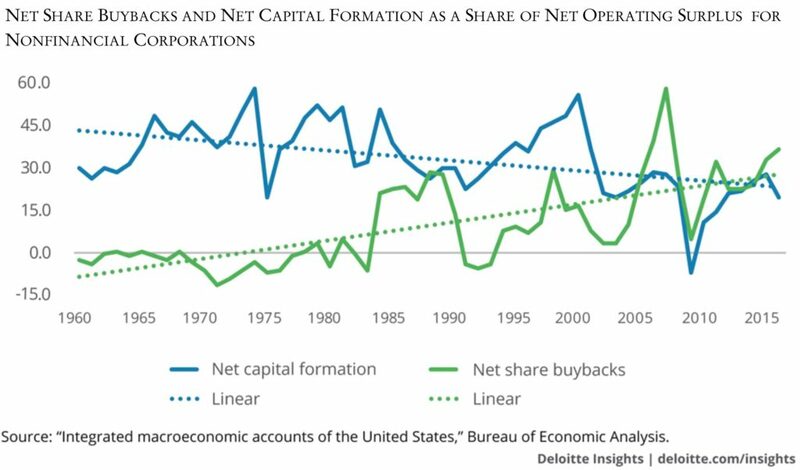 In almost all cases, companies do buybacks in order to return capital to shareholders and boost their stock price by reducing the number of shares outstanding and thus improving earnings-per-share (EPS) metrics. Buybacks have also come to be preferred over dividends because they enjoy a tax advantage: shareholders who do not sell immediately receive a tax deferral on the price appreciation resulting from the stock’s increased EPS, whereas dividends are subject to tax immediately upon payment. Returning to the main question, however, defenders of buybacks argue that returning capital to shareholders does not come at the expense of productive investment but rather represents the best use of capital available and allows shareholders to allocate capital to other companies more in need of it. Like most neoliberal economic arguments, this claim benefits from a certain logical simplicity, but it totally breaks down when applied to the real world. First, the statistics simply do not support this argument. According to data from the Peterson Institute for International Economics andBloomberg, in 1980 total capital return (buybacks plus dividends) represented about 2 percent of U.S. GDP, while investment was close to 15 percent of GDP. In 2016, investment represented around 12 percent of GDP while capital return was about 6 percent of GDP. To be sure, there is some variation in these numbers year over year, but the long-term trends are obvious. And remember: because government investment has been in decline over the same period, private-sector investment would have to grow significantly, and to levels well above its previous highs, for the country as a whole to maintain the same level of overall investment. Some try to obfuscate these general trends by isolating year-over-year changes in investment and buybacks and highlighting that in many years both capital return and capital expenditure increased versus the previous period. The problem with focusing solely on year-over-year changes, however, is that it ignores the accumulated effects of the change in corporate behavior over time. It also undermines the second part of theargument—that buybacks lead to the more efficient allocation of capital. If companies are simply returning more capital whenever they have morecash—and buying back stock even at unusually high valuations—then there is no reason to believe that increasing share buybacks has anything to do with changes in a given company’s investment opportunity set. Thus there is likewise no reason to believe the argument that higher levels of capital return have led to the more productive deployment of capital. If that were the case, one would expect to see significant increases in productivity, but that has not materialized, and, if anything, the opposite has occurred. Others argue that the phenomenon of corporations returning more and more capital simply reflects changes in the broader economy—thedecline of capital-intensive industries and the rise of intellectual-property-oriented businesses and service industries. But this argument does not answer the fundamental questions around investment; it simply restates them. Why are capital intensive businesses no longer attractive investments in the United States? And if asset-light businesses are so profitable, why are they not attracting and deploying much more capital to invest in further expansion—which might even spread the presumed benefits of the “digital revolution” more broadly throughout the country? These questions become much easier to answer by simply looking at the concrete motivations of financial markets participants and corporate executives. The actual behavior of today’s corporations and institutional investors makes the problems of the shareholder-driven economy even more evident than abstract theoretical or data analysis. The idea, for example, that capital returned to shareholders is going to market participants that are unconstrained, rational, and sufficiently well-informed and incentivized to better deploy that capital and invest it more productively is just laughable. When an activist investor profits by pressuring a company to return more capital (or a non-activist stock-picker correctly chooses one), it is highly unlikely that this investor will subsequently redeploy those profits to a growth investment. On the contrary, the investor will use the now larger pool of capital—probablyaugmented by new capital raised from limited partners on the basis of a successful track record—to pursue the same strategy on different targets, simply pressuring other companies to increase capital returns to shareholders. Most fund managers are highly constrained in what strategies they can pursue, and they cannot simply flip from shareholder activism one day to funding risky technology investments the next, much less seed fledgling startups. Even funds that can pursue multiple strategies rarely have the expertise or interest to fund entrepreneurial investment. Their analysts are trained to view equity ownership as nothing more than “an option on future cash flow streams.” Most of the time, they have at best a cursory, secondhand grasp of business and industry dynamics, much less any entrepreneurial desire to fundamentally remake an industry or product. If all that matters are annual performance numbers, why pursue a complicated, unpredictable, and risky entrepreneurial investment if it’s possible to engage in easily quantifiable financial engineering and profit in the short term? In addition, these firms get their capital from limited partners (LPs) such as university endowments, pensions, and funds of funds. The employees of these types of firms are typically more rules-constrained, less well-paid, and therefore less ambitious than, say, the hedge fund manager they allocate capital to. These LP managers also rarely benefit much from outperformance, but can often lose their jobs after even a short period of underperformance. Hence, an extreme amount of group-think and risk aversion prevails among these sources of capital. Along with family offices representing ultra-high-net-worth individuals, they also tend to prioritize “capital preservation,” reducing risk and volatility, rather than aiming for transformational investments. For all these reasons and more, the major pools of investor capital are inherently predisposed to prefer the near-term safety of financial engineering over risky, long-term investment. The net result of these dynamics is that the “gains” from corporate capital returns are rarely reinvested in capital-starved growth companies. Instead, more and more capital is simply deployed to pressure more and more companies to engage in more and more financial engineering. And even when companies do not face external pressure from Wall Street, executives know what sort of behavior gets rewarded by markets—sharebuybacks. Combine this with a situation in which executives are principally motivated by stock-based compensation, and the incentives to manipulate stock prices through financial engineering rather than undertake long-term productive investment become even more problematic. Thus whatever principal-agent problems might have afflicted midcentury corporate executives, giving more and more power to “shareholders” and financial markets today is the opposite of entrepreneurial. Meanwhile, during the last several years, passive index funds have come to be major shareholders of most publicly traded companies. A passive index fund, of course, is going to do very little in terms of capital reallocation in response to buybacks. Theoretically, the ultimate beneficial owners might. But, then again, the people putting their money in passive index funds are probably not highly responsive to any single company’s decisions, nor are many of them likely to be interested in evaluating the business models, capital needs, and investment opportunities of individual firms. Furthermore, at this point, it is impossible to ignore the fact that actual corporate behavior frequently and egregiously contradicts the theoretical justifications of buybacks and financial engineering. To take some recent, high-profile examples: General Electric’s (GE) stock price has fallen from around $32 in 2016 to around $7 today as multiple business lines have experienced distress. Yet GE spent a total of $24 billion buying back its own shares in 2016 and 2017. How could anyone plausibly argue that this represented the most efficient use of capital for the company? And even if one wanted to make the preposterous case that this spending did not somehow “come at the expense” of the investment desperately needed to shore up GE’s operating businesses, then surely returning capital through dividends would have been much better for long-term shareholders. Removing the current disparity in the tax treatment of buybacks is the least that could be done. Before GE, there was IBM. IBM spent around $105 billion on buybacks from 2005 to the early 2010s, artificially inflating its EPS even while its revenues were declining and its technology was obsolescing. The company still trades far below its 2012 levels. There is perhaps no better example of value extraction and self-inflicted value destruction (by legal means) in modern corporate history. The fate of these two former national corporate champions is, sadly, probably a harbinger of what is to come for the U.S. economy as a whole if recent trends continue. One could list many more examples totally disproving the notion that buybacks are an efficient use of capital, or that companies prefer to buy back shares when valuations are unusually low, and so on. On the contrary, until the bonanza of recent years, spending on buybacks reached its highest levels just before the financial crisis. In fact, among America’s largest companies, the amount spent on share buybacks and dividends has exceeded free cash flow since 2014. This means that corporations are not simply distributing excess cash; they are actually borrowing money in order to fund capital returns to shareholders. Much of the re-levering of U.S. corporate balance sheets since the end of the financial crisis, in fact, has occurred because companies are distributing so much cash to shareholders. Even if one wants to make the frankly fantastical assumption that this has not occurred at the expense of investment in the present, it certainly constrains corporations’ ability to invest in the future. Money spent on buybacks, after all, does not create any asset for the company; it does not create any future revenue stream. Yet the interest and principal on that debt will have to be repaid by the company. In other words, the core activity of the U.S. corporate sector today is actively cannibalizing future growth in order to inflate the prices of financial assets that are already trading at historically high valuations. Barely a decade after the financial crisis, we are again witnessing one of the greatest systemic misallocations of capital in American history. Even the most successful companies are not immune from these pressures. Following the passage of the 2017 tax cut, Apple announced a $100 billion buyback program for 2018. Yet how is turning this cash over to the financial markets supposed to benefit the economy? Not only is Apple at the forefront of a high-technology sector, but its management has a relatively good track record of developing innovative products in recent years. It is one of the few companies with the scale needed to invest in size in fundamental, capital-intensive innovations. These resources could have been used to build manufacturing capacity in the United States or to pursue advances in new technologies like quantum computing or AI. Even if the cash remained on Apple’s balance sheet—though that’s hardly an ideal scenario—it would still be more likely to be deployed productively in the future than it is now—sitting on the balance sheet of a passive investment vehicle, or in the hands of some overrated equities trader. At bottom, the only justification for returning capital to shareholders is that there is no better investment option available to the company. And while it is true that any given business may from time find itself in such a situation, when this is said to be the case year after year at a massive scale, it raises profound questions. Goldman Sachs estimates that $1 trillion will be spent on buybacks in 2018—that is $1 trillion that the corporate sector is saying it cannot invest profitably. Now, either the corporate sector is wrong: maybe there are more investments to be made, and capital is simply being misallocated due to horrendously misaligned incentives. Or there are in fact no better investments to be made, and the corporate sector simply has no use for this vast sum of capital. If the latter is true, however, it calls into question the viability of the free market capitalist system itself. After all, the entire social justification of free enterprise is that the private sector is the most capable of finding productive investments and deploying capital effectively. But when the corporate sector itself admits that it has no use for vast and ever-increasing amounts of capital, then someone else must find a use for it. More precisely, the state should use it to fund public investment, which in many areas is sorely needed. In this sense, taxing capital returns to shareholders is one of the most efficient taxes conceivable, since the entity being taxed has already admitted that it has no use for the cash. On the other hand, some like Matt Bruenig go even further, arguing for full nationalization of ownership. And if in fact the financial system continues to incentivize more and more value extraction and less and less value creation, then it will become difficult to refute these arguments on any economic grounds. As Ronald Reagan might say, America’s largest shareholders and corporate managerial classes have reached a time for choosing. Either they will begin investing in the future of this country again, or they will continue to surrender their most important role in a capitalist economy, until the system collapses on itself. The main opponents of any government effort to encourage the better allocation of capital and promote domestic investment invariably style themselves as defenders of markets and entrepreneurs. But by parroting the notion that the corporate sector generates massive amounts of excess capital for which there is no productive use, these brain-dead ideologues and apparatchiks are actually undermining the basic justification for free enterprise itself. Perhaps it should not surprise anyone that the advocates of share buybacks often fail to appreciate the long-term implications of their position. But the question raised by the intensifying debates over value extraction versus value creation is no less than the question of whether it is possible—through better policy choices that correct skewed incentives—to save capitalism from itself. Previous Post Who’s Really Afraid of Socialism?